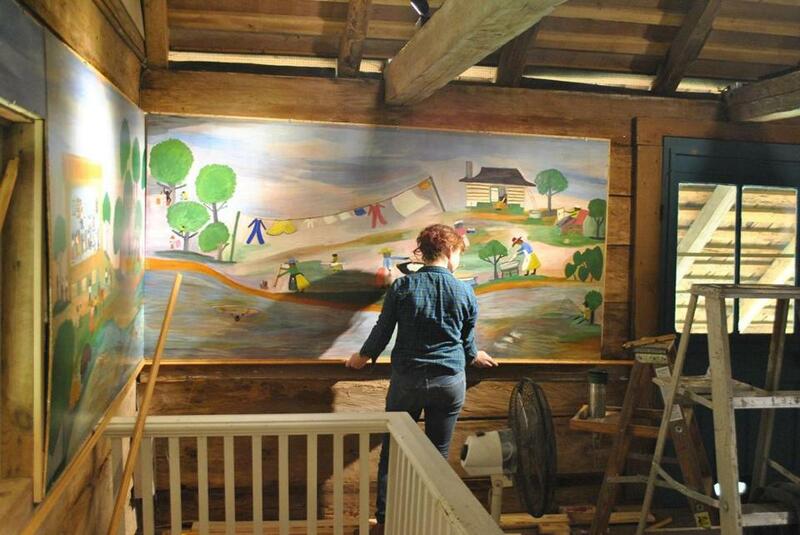 A worker at Melrose Plantation helps with conservation of the murals. Although self-taught artist Clementine Hunter may not be a household name, she is well-known to most Louisiana residents, who, for more than 40 years, have made field trips and family outings to Melrose Plantation, just south of Natchitoches. It was there that Hunter worked and raised a family, and when she was 52, took up painting — on discarded window shades, cardboard boxes, iron skillets, her personal snuff jars and, eventually, actual canvases. By 1955, Clementine Hunter had been discovered by the art world, and she became the first African-American artist to have a solo show in New Orleans and also a show at Northwestern State College (now University). As an African-American, she was not allowed into the college gallery with white patrons; she had to be snuck in the back to see her own exhibition. In that same year, her friend and mentor Francois Mignon suggested she try her hand at murals, to be installed in the attic room of African House. African House had been so named by a visitor to Melrose because of its unusually wide-spreading hipped roof, similar to African dwellings. Recent scholarship has determined that Melrose’s landowner in the early 1800s, Louis Metoyer, simply designed the roof to allow air to circulate to the second floor to dry tobacco. Hunter began the murals on June 8, 1955, and completed them on July 21, working long hours in the hot, humid Louisiana summer, painting from sketches she had made for each panel. The historic value of these nine murals cannot be underestimated, since they document a way of life that lasted all the way to the Second World War. That backbreaking sharecropper existence came to an abrupt end, however, with the migration of African-Americans to the North and with the advent of machines to do the farm tasks. Also significant was the break-up of the tight-knit Creole communities in the Cane River area, who were a mixture of Spanish, French, African-American, and Native American peoples. After the mural project, shows of Hunter’s paintings were organized across the country, with her work now residing in many permanent collections. In 1986, Hunter was awarded an honorary degree from the same institution that had denied her access in 1955: Northwestern State University. The first painting is a simple disc-shaped map of the Cane River region, highlighting its three main products: cotton, pecans and churches. The other eight panels are approximately 8-feet-by-3½-feet each. The first two panels show cotton planting, hoeing, and harvesting, with a wedding scene in one and a revival in the other. Hunter’s humor shines through. She portrays women larger than men, because she felt they were more important to plantation life; if there was a minister she wasn’t fond of, he became the smallest figure. The next two panels picture a Cane River funeral and a river baptism, with unusual perspectives and personalities set into each. The “Wash Day Mural,” with a clothesline of colorful undies, has the artist herself busily painting in an upper corner. The accompanying panel has the pecan harvest on one side and a Saturday night honky-tonk scene on the other. The latter has several vignettes of violence which made Hunter vow that “[they] never get a chance to kill me in that place!” The final two murals show more relaxed activities on the grounds of Melrose, including African House, Yucca House, the Big House, and an oversize sundial. Melrose Plantation has its own rich backstory. From 1796 to 1847, it was owned by four generations of African Americans, descended from a vibrant matriarch named Marie Thérèse Coincoin, a slave whose love-mate and father of 10 of her 14 children, a French merchant named Claude Metoyer, bought her freedom and that of several of their children. In 1796, one of her sons, Louis Metoyer, was deeded 911 acres of land, on which he began the buildings that compose the current-day Melrose. After some ups and downs, the property passed to John and Carmelite (“Cammie”) Henry in 1899. After her husband’s death in 1918, “Miss Cammie” turned the plantation into an artists’ colony. Hunter’s family had moved to Melrose when she was a teenager, and there she did pick cotton and harvest pecans. She continued to do field work, even as she began to have children, seven in all. In the late 1920s, she became a housemaid, occasional cook, and even nanny to the Henry children. Her creativity was already evident, in the quilts she pieced, the baskets she wove, and the dolls she made for the children. Hunter was often quoted as saying, “When you pick cotton, you sweat with your body; when you paint, you sweat with your mind.” And sweat she did, turning out more than 5,000 works over her lifetime. (She painted until just a few months before she died at 101, in 1988.) Despite never learning to read or write, Hunter recorded the story of her life and of the Cane River community in her own unusual, pictorial way.